One serving or more of any fried foods each day – such as chips or a fried chicken sandwich – increases the risk of death by 8% compared to eating none, experts found. The study, published in the British Medical Journal (BMJ), found particularly strong links with fried chicken and fish – foods that the authors assumed were mostly deep fried. It found that one or more servings of fried chicken a day was linked to a 13% higher risk of death from any cause and a 12% higher risk of heart-related death compared with no fried food. Meanwhile, one or more servings of fried fish or shellfish a day was linked to a 7% higher risk of death from any cause and a 13% higher risk of heart-related death. The research followed 106,966 women aged 50 to 79 who enrolled in the Women’s Health Initiative (WHI) study between 1993 and 1998. They added: “We have identified a risk factor for cardiovascular mortality that is readily modifiable by lifestyle and cooking choices. 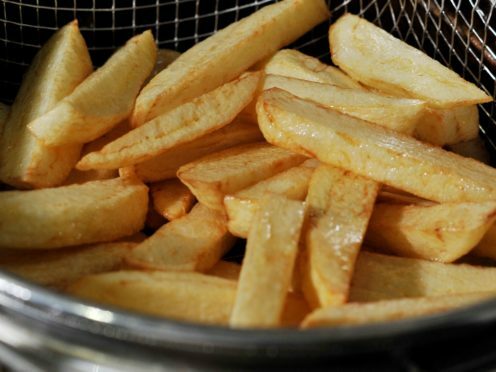 Tracy Parker, senior dietician at the British Heart Foundation, said that simple changes in how foods are cooked can make a big difference to heart health: “Fried foods are usually higher in calories, fat and salt, and portion sizes are often larger – especially when you eat out or order in. “And if you eat a lot of fried food then it often follows that your wider diet and lifestyle could be healthier. This is a recipe for trouble, which can lead not only to weight gain but other health issues, such as high cholesterol, high blood pressure and type 2 diabetes – all risk factors for developing heart and circulatory diseases in later life.